Korean barbecue here at SURA Korean BBQ Restaurant may get all the attention — well deserved we might add, but soups and stews really take a considerable presence in Korean cuisine. No matter what else is on the dinner table, you’ll always find soups or stews, sometimes serving as a palate cleanser between bites of heavier dishes. Stews — you’ll recognize them by the suffix “-jjigae” — are generally cooked quickly, bringing together a panopoly of ingredients, whereas Korean soups — with the suffix “-guk” or “-tang” — are brothy, spartan, and cooked for hours or even days. Both are meant to be eaten with steamed rice on the side. Simple soups are often offered alongside other main dishes. On the other hand, more complicated and hearty stews are sometimes shared communally on the table. 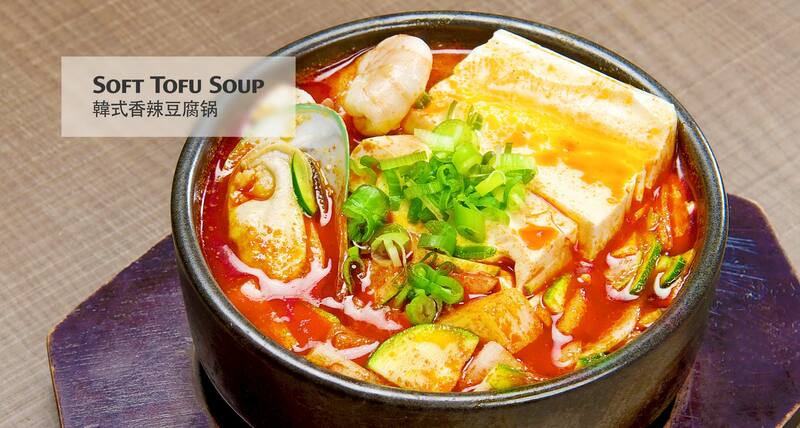 Many Korean soups have specific functions. Is the ground spinning because you drank too much last night? Try Spicy Beef Soup (Yukgaejang, 육개장). It is made with shredded beef with scallions and other ingredients, which are simmered together for a long time. Feeling sniffly, like you’re about to get that cold that everyone gets in the middle of a hot summer? Kill two birds with one stone with a bowl of steaming Ginseng Chicken Soup (Samgyetang, 삼계탕). It is made with a whole young chicken stuffed with sweet rice slowly simmered in a broth of Korean ginseng, jujube fruits, garlic, and ginger, and it is meant to prevent illness and to promote sweating to cool the body! Instead of relying on pure salt, the chefs are supposed to season these dishes with soy sauce, salted baby shrimp, fermented miso, dried anchovies, and fish sauce. Spicy heat comes in from hot pepper flakes, fresh hot peppers, dried hot red peppers, or Gochujang, a richly spicy, thick, and slightly sweet red pepper paste. The soup bases are made with beef, chicken, dried anchovy, or seafood. Here at SURA Korean BBQ Restaurant, we take pride in using only the freshest & the finest ingredients available to serve our outstanding customers with this delicious and healthy Korean foods. We look forward to serving you in the near future!